Jake Schindler won just over $2.1 million for winning the partypoker MILLIONS Grand Final. Over the last 12 months, Jake Schindler has proven to be a legitimate threat in high roller tournaments around the world. He finished runner-up in the 2017 Super High Roller Bowl, runner-up in the Seminole Hard Rock Poker Open High Roller, third in a Poker Masters $50,000 event, runner-up in the US Poker Open Main Event. In March, he picked up two wins in Aria High Rollers, but on Wednesday in Barcelona he posted what could be considered a breakthrough win. 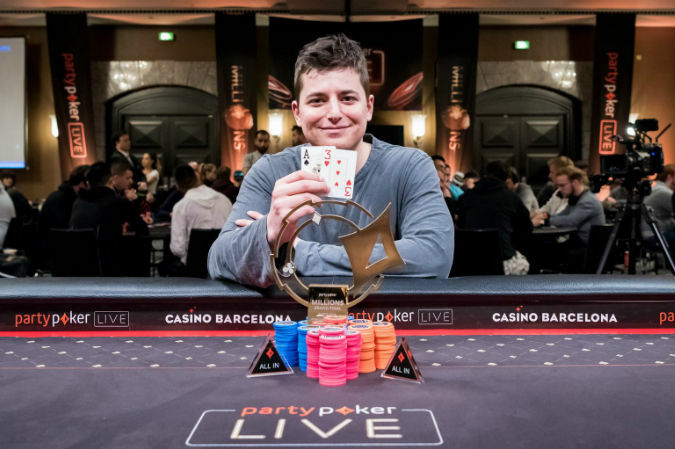 Schindler beat Stephen Chidwick heads-up and overcame a final table that included Erik Seidel, Jason Koon and Bryn Kenney to win the partypoker MILLIONS Grand Final €100,000 Super High Roller for €1,750,000 ($2,163,174 US), the second biggest score of his career. The day began with 11 players still in contention for the €1.75 million first place prize but Koray Aldemir, Dominik Nitsche, Mikita Badziakouski, Steffen Sontheimer all failed to make the money, and once Keith Tilston went out in seventh, the remaining six players were all in the money. The first player to bust was Seidel. Down to less than five big blinds, Seidel three-bet all in over Kenney’s UTG raise. Kenney called and showed which put him ahead of Seidel’s tabled . The gave Seidel more outs but the turn and river were no help and he was left with a sixth place finish. Despite picking up the first in-the-money elimination, things went south from that point on for Kenney. Kenney was on the button and raised to 350,000 and Schindler called from the big blind and then checked after the flop. Kenney bet 305,000 and Schindler raised to 1,200,000. Kenney moved all in for 4,410,000 total and Schindler called. Kenney showed for an open-ended straight draw while Schindler showed for middle set. The turn was a blank and Schindler improved to quads with the river to bust Kenney in fifth. A little over an hour later two more players were sent packing in quick succession by Chidwick. From the button, Chidwick raised to 400,000 and Koon moved all in from the small blind for 5,975,000. Chidwick called and turned up while Koon showed . The board ran out to eliminate Koon. Left with just three big blinds, Jean-Noel Thorel moved all in for 600,000 from the button and Chidwick and Schindler called from the small and big blind respectively. The flop saw both remaining players check. The turn got Chidwick to be enough for Schindler to fold. Chidwick showed for top pair with the second nut flush draw. Thorel needed help with the but got none after the river to go home in third. Heads up play began with Schindler holding just 54% of the chips in play. The two players traded the led back and forth for almost three hours before Schindler was able to finish Chidwick off. On the final hand, Schindler raised to 875,000 and Chidwick called. The flop came , Chidwick checked, Schindler bet 500,000 and Chidwick called. The turn was the and Chidwick checked again, Schindler bet 1,800,000 but Chidwick raised to 5,100,000. Schindler called and both players saw the river. Chidwick moved all in and Schindler called. Schindler showed for a bluff while Schindler showed for a wheel and the final pot of the night.